Long Reads · Sports | Boston Red Sox · Sports | Washington Nationals · Washington D.C.
i might be about done with the washington nationals. the austin spaklers are in town for the lady sparkler’s birthday, and to get some some quality time with her belly. 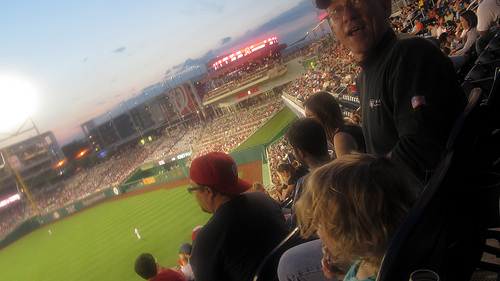 it’d been a year since we saw a nats game, so we tossed in one of those for good measure. it turned out that we had three sets of friends there, and we had a great time all around. the food — ben’s chili bowl, again — was fantastic. the stadium is beautiful. but the game was awful. of course, part of that might be because the nationals are awful. luckily, they were facing the orioles … who are equally awful. the two teams are averaging 6 runs allowed per game. together, they allow more people on base than any other teams in the league. washington leads the league in errors, and baltimore is close behind. both are in last place in their division. all that futility should mean a scorcher of a game. but alas, did i mention it was awful? i swear, there was 20 minutes between each inning. it took until the 5th inning for washington to score its first run (which would also be the last). the game was over in two hours and 31 minutes, but i would have guessed it was twice that. in fact, when nat’s shortstop Cristian Guzman homered in the 5th i was excited … until i realized that it tied the game, vastly increasing the chance it would go into extra innings. but worst of all, we had to watch all the happy O’s fans … who have to win the award for most socially awkward fan base in the country. i know that baseball is a game of stats (which is probably a polite way of saying math geeks) but O’s fans makes red sox and yankees fans look normal by comparison … preppy or thuggy, as the case may be, but without that certain “a/v club” veneer. but, at least the O’s have fans. honestly, the nats would have better success if they built a giant bar, with great food, a huge HD television, and a $25 cover charge. that way DCers could come and socialize, without feeling guilty about paying attention a baseball game. in the end, the two-plus hours where i didn’t watch the game was great, but the 20 minutes of the game i watched during pauses in the social agenda felt like an afternoon at the dmv. it took forever, and no one was particularly happy with how it turned out. the red sox pulled another rabbit out of a hat, last night, and their improbably run through the playoffs continues. i hate to say it, but i didn’t think they’d make it out of the first round this year … with Manny almost single-handedly destroying the team and the team bogged down with so many injuries. … just made me feel guilty. earlier in the day, i had (yet another) water cooler conversation about playoff baseball. one was a brewers fan, who was (mostly) content with Milwaukee’s valiant run to the playoffs, which would have been the envy of every small market team in baseball if the Tampa Rays weren’t still in the thick of things. the other was an orioles fan was reminiscing about the last time they had young, promising talent good enough to win the rookie of the year award (answer: never) and bemoaning the groundswell of “fans” jumping on the red sox band wagon since ending their 86 year championship drought in 2004.
that’s when i felt the guilt … i was an orioles fan (*gasp! *) as recently as 2002.
it all started in earnest when i moved to a place about eight miles from Camden Yards. growing up, i had been raised to root for the home team: my Vermont brother (red sox), my Maine father (Boston braves, and then red sox) and my new york grandfather (Yankees) all supported the local teams. I’d argue that it’s your civic duty. but then 2003 happened. i moved to dc (who was desperately trying to get their own team, one which i root for in the National League) which relieved the Orioles of their position as the team next door. I also came to the realization that Peter Angelos, owner of the Orioles, was actually the anti-Christ based on his sad attempts to keep a team out of DC (a rant already rant-ed at length). so, without a team to cheer for (the Nats hadn’t arrived yet, and i had blacklisted the O’s) i started shopping around. so, after spending most of 2003 without a team to cheer for, the post-season saw me rooting *against* the Yankees yet again, which based on their ALCS match up with Boston, meant i would need to root *for* the Red Sox. i watched all seven games of the series that year, and got (what turned out to be) my only true flavor of the misery that being a Red Sox fan is associated with: series tied at 3 a piece, game tied 5-5, Yankees at bat to begin the bottom half of the 11th inning … first pitch is knocked out of the park by Aaron Boone. Yankees win the game. Boston loses the series. i barely knew what a baseball was during the last major Sox tragedy (Bill Buckner and the ball between the legs in ’86) but if it sucked anything like this did, I’m glad i was too young. and, from that point on, i was hooked. i even converted the lady sparkler into enough of a fan that she believes “@$%#$” is J.D. Drew’s middle name, knows that Big Papi needs to get his act together and start bringing in some runs, and thinks Jacoby Ellsbury and Dustin Pedroia are cute (I’ll take my in’s how ever i can get them). so, there you go. red sox nation member since October 2003. five years and two championships later, life on the bandwagon is great. i just want you new punks to know that i was hear first, even if it wasn’t by much. 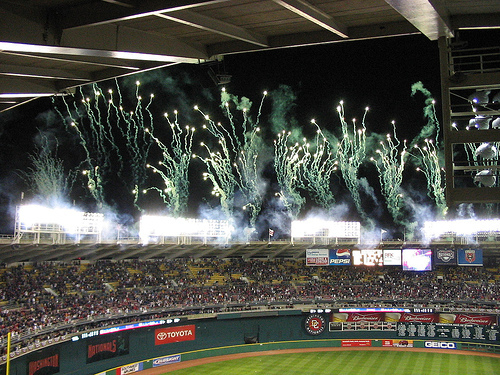 exxon is all over the new nationals ballpark: their logo covers the left field wall, are regularly featured on the scoreboards that circle the stadium, rotate through the television ad behind home plate, and are the “official sponsor” of the seventh-inning stretch. normally, this wouldn’t raise an eyebrow (especially if the ballpark was in Texas) but considering that nationals park is the first stadium in the country to be certified (LEED) by the U.S. Green Building Council, there are more than a few allegations of green-washing. so, here’s the comedy of this good will campaign … tonight, in the break before the 8th inning, the stadium P.A. guy announced each ticket holder in one of the 100 sections would get a $50 gas card courtesy of Exxon/Mobil. people (obviously) rejoice. so, the stadium camera (which powers the 4,500 square foot high definition scoreboard in center field) zooms in on one of the lucky winners, but he’s *refusing* to take the card … and when the very confused stadium attendant persists, he finally takes the card and chucks it across the stadium. truly a moving sign of protest, right? well, mostly. right before the camera guy comes to his senses and turns away for this P.R. fiasco, in the background you see a group of people lunging for the air-borne gas card like it was a home run ball. Photography · Sports | Washington Nationals · Washington D.C. 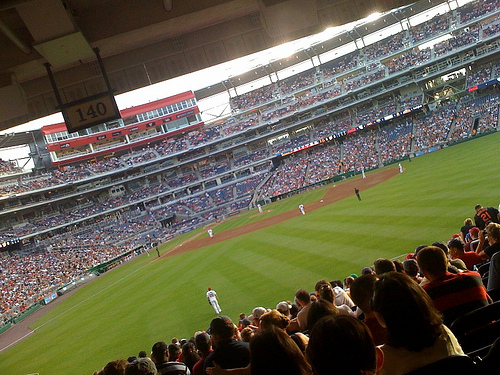 The Washington Nationals played the first baseball game in Washington DC since the Senators left in 1971. The Nats beat the Arizona Diamondbacks 5-3.